After years of anticipation the most exciting part of the growth in the Flamingo Beach area of Guanacaste is the resurgence and re-launch of the full service Marina in Playa Flamingo. Final approvals have been stamped and development of the Flamingo Marina is about to begin. A Costa Rican Coast Guard station is already in place in Flamingo along with other marine services. The new Marina at Playa Flamingo, Costa Rica, will be a huge boost to local real estate investment opportunities and tourism business in the area. Projected to be home for 211 boat slips, including slips for luxury yachts. Current plans call for a unique hotel with 130+ rooms and space for Marina-front bungalows. The Flamingo Marina is an exciting addition to this popular area of Costa Rica. At the new Flamingo Marina, a convention center is proposed to hold up to 800 people and a 10,000 square meter area will be set aside for restaurants, shopping, and retail shops with 300 parking spots, making it convenient and easy to enjoy the new center of excitement in Guanacaste, Costa Rica. In keeping with Costa Rica’s dedication to the environment, a thorough Impact Study was conducted, ensuring minimal impact to aquatic life. 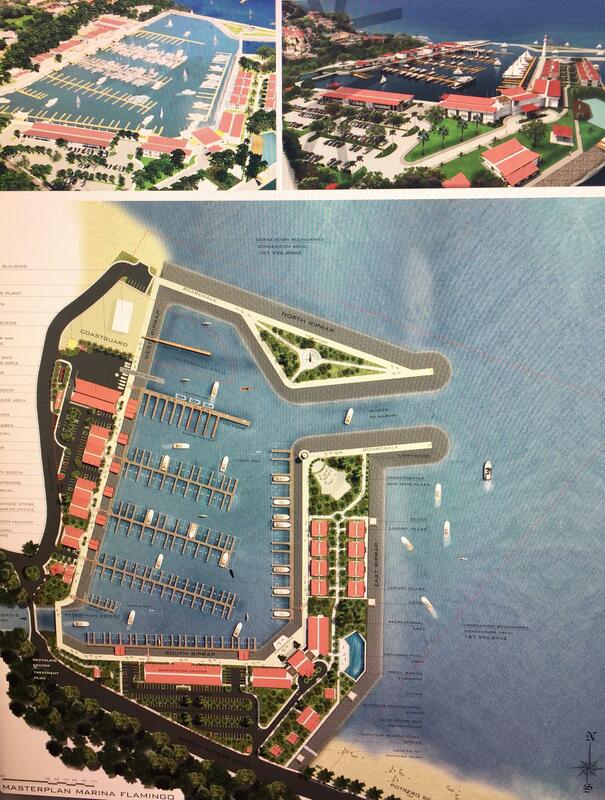 The American Marina Company will build the new marina with dredging to begin in the later half of 2018 and once the Marina is completed construction of the hotel, shops and restaurants will begin. To literally top off the pending real estate boom in Flamingo, Ed Podolack the former NFL great for the Kansas City Chiefs is heading up the development team and currently building 360 Splendor del Pacifico Residences a collection of luxury condos perched on the hill over looking the new marina and Playa Flamingo. Playing off the 360 degree views of the Pacific Ocean, 360 Splendor del Pacifico will dominate the new marina and Flamingo skyline. Now is a great time to invest in Flamingo!